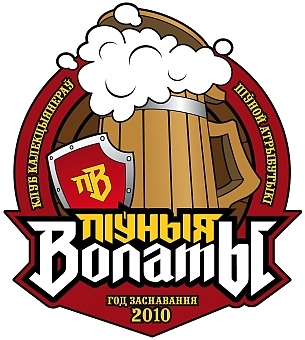 "Piunyia Volaty" (later referred to as "volaty.by" since the native name is impossible to spell and pronounce in English) is a Belarusian public organization uniting mainly collectors of breweriana collectibles and other people interested in beer culture and history. We collect labels, beer glasses, coasters and more, hunt for new beers and seek for information about beer. "Volat" is (epical) hero in Belarusian language, which means we are shamelessly claim we are "big" people in beer related area. Through collecting actions we get to know beer geography, we perceive the beer diversity and save beer history. We often travel and visit breweries of different sizes in Belarus and abroad; we go to beer festivals and exchange meetings. We also organize collectors exchange meetings in Minsk (which is the capital of Belarus if you didn't know). All those visits and meetings help us to extend our range of beer vision, establish new contacts and invite more people into beer world. We are always open to setup new connections with the clubs of other countries. There are not only Belarusian members in our club. We invite collectors from all over the world to join.